We have been advised that the A38 tunnels through Birmingham city centre are going to be closed for six weeks this summer while essential refurbishment is carried out. The St Chad’s and Queensway tunnels will be completely closed to all traffic from 19 July to 2 September. The closure will be preceded by four weeks of overnight closures, from 10pm to 6am, and followed by up to two weeks of similar overnight closures. People who work in the city centre or who visit Birmingham are being urged to consider how they travel during the six week closure period, with train, bus and cycling all being viable alternatives to driving. Councillor Tahir Ali, the City Council’s cabinet member for development, jobs and skills, said: “I would urge everyone who regularly drives into the city centre, particularly at peak times, to consider alternatives. Although the work has been planned for the school holidays when there are fewer vehicles on the roads, it will still have an unavoidable impact. Drivers should consider using public transport, cycling or even walking where it is feasible. Birmingham City Council…..another fine mess! 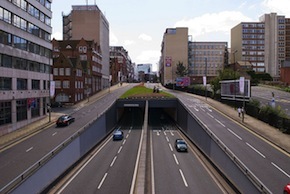 I suppose you would prefer it if one of these tunnels collapsed while there were cars in it? The tunnels are 40 years old – what do you expect the council to do? Have you got any suitable alternatives to repairing them, because if so, I’m sure the council would be delighted to hear them! After all, it’s not as if there isn’t plenty of public transport running to and from the city centre. Keith, don’t see what the problem is really, repairs have to be done, when do you suggest this takes place? I would say Birmingham City Council have done well to inform people this far in advance actually!